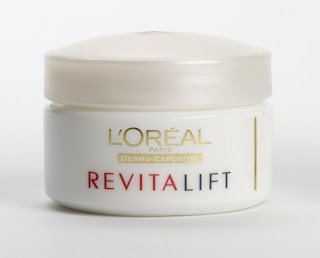 This week I have a guest review from Jane Willis from The Competition Grapevine (aka my Mum) of L'Oreal's Revitalift Moisturiser for 40+ skin. I have been using this for several weeks now and have not found any significant change in my skin. My usual cream is L'Oreal Age-Reperfect so I presume the active ingredients are very similar. The Revitalift cream seemed to be slightly heavier on my skin and not quite so easily absorbed - an advantage at night, but the very slight residue it left made it less suitable for day time use,especially as I am a spectacle wearer and find cream residue around the outer eye area can smear my glasses. One thing I did particularly like about the cream was the fragrance. When I was in my teens, I already had dry skin so while friends were trying the latest anti-grease ands pot treatments, I was already buying moisturiser. As soon as I opened the Revitalift jar I was taken back to the smell of my first ever moisturiser. I can't remember the brand name but there was a very 1960s style dolly-bird face on the jar!